Judin House in Berlin, Germany. 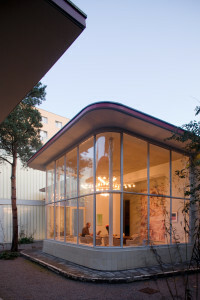 A 50’s gas station has been converted into a house and gallery. Where fuel pumps used to stand, diners eat at outdoor tables under twinkling lights in St. Louis, MO; a gleaming modern kitchen has replaced an auto-body space in Berlin; and two abandoned stations in Amsterdam now charm passersby with the shifting lights of an LED art installation. Instead of remaining vacant markers of suburban sprawl, these projects demonstrate stations’ vast potential for reuse. During the first half of the 20th century, the gas station was everywhere people wanted to drive, found at highway off-ramps, on small-town street corners, and scattered along country roads. Yet despite their utilitarian function—or perhaps because of it—the mid-century architecture of these places was charming, with curved edges, bright graphics, and lots of glass to entice customers. Even Frank Lloyd Wright got in on the act, designing the R.W. Lindholm Service Station in Cloquet, MN. Recognizing their potential, that’s exactly what some people are doing. Judin’s house, which had sat empty for more than 20 years, was completely transformed with the help of German architects BFS Design. Outside, the concrete canopy that used to shelter the fuel pumps now has jaunty red legs and floats over an outdoor sitting area. Inside, bright white spaces are framed by the original walls of windows, “you can still see and feel that it was a space built for cars,” says Judin. Other projects similarly celebrate the original aesthetics of gas stations—and today contribute to their surroundings. Ben Poremba remade a 1930s station in a blossoming St. Louis neighborhood into Olio, a lively restaurant where patrons snack on scallop ceviche at marble counters. “The building was given a new life and vibrancy,” he says. “And Olio was an integral part of neighborhood revitalization.” In north Amsterdam, Sophie Valla Architects created a vivid LED-hued art installation out of two nondescript 1980s stations, and a new social-center in Montréal was an Esso station designed by Mies van der Rohe in the 1960s. There are of course inherent challenges in remaking these old stations. Underground fuel tanks must either be removed or filled with sand, lead paint must be stripped, and soil must be cleaned. In addition, trying to recreate the aesthetics requires sourcing vintage touches such as period wall tiles and brass knobs, and refurbishing curved windows and garage bays. But overall, the benefits far outweigh any drawbacks. Want to find out more? Check out the NPS Preservation Brief, The Preservation and Reuse of Historic Gas Stations.